This card is made with the same Brusho background as this one. 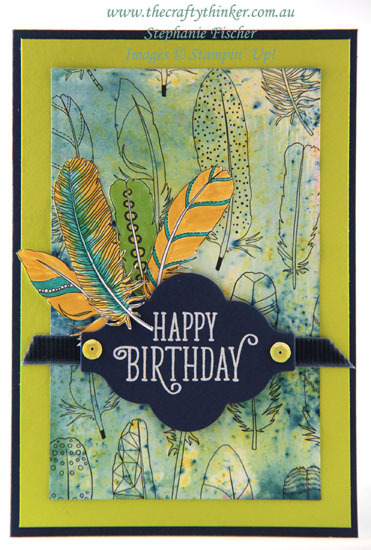 The feathers tucked into the greeting panel are coloured with Stampin' Write Markers and the greeting (from the Happy Birthday Gorgeous stamp set) is white heat embossed onto Night of Navy cardstock. To make that label, I first cut the cardstock with one of the Lots of Labels dies and then, lining it up carefully, moved the die to shorten the piece and ran it back through the Big Shot. The finishing touches were the piece of Corduroy Ribbon and the Tutti Frutti Self Adhesive Sequins.